This was a special Birthday year for Hali, and she decided that a 2 week trip to Costa Rica was the best way to observe the occasion. 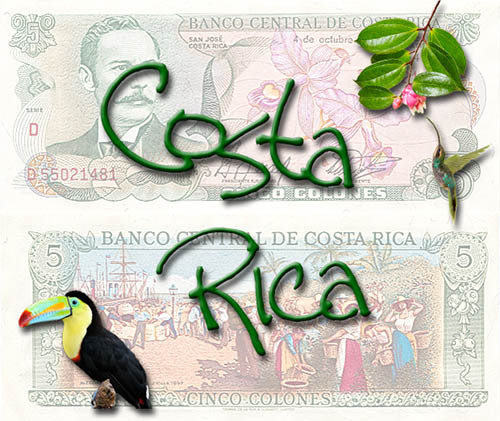 She found a great photo tour for Costa Rica -- even if it was several months prior to her actual B-day. The tour was with Moab Photo Tours and Tom Till, in conjunction with Greg Basco (Foto Verde Tours). The trip began just outside of San Jose proper at the lovely Hotel Bougainvillea. This wonderful hotel is really more like a small resort. Sure it has great rooms (with wi-fi), fantastic food at reasonable prices, a great pool area, and a fitness room. But it also has very large, well kept grounds that are fantastic to roam about. All kinds of birds frequent the grounds, and the ponds are home to some of the highly endangered Yellow-eyed Leaf Frogs. After a couple of days on own own, we then met with the remaining 6 tour attendees and moved on to the lowlands rainforest portion of the tour. The resort there was a great place named 'Selva Verde'. This place was loaded with poison dart frogs, red-eyed tree frogs, basilisk lizards, and all kinds of interesting wildlife. There was no A/C in any of the resorts on this trip, so you have to be prepared for high humidity conditions. The things you will see are well worth the sweat! The next destination was the Arenal Observatory Lodge, right next to the Arenal Volcano. This is another great resort with superb food and expansive grounds. Even as we unpacked from the van we saw a Coati just a few feet away. There are a great variety of birds and wildlife to be seen here, as well as super views of the Arenal Volcano and Lake Arenal. The amazing, bubbling sound of the Oropendola could often be heard, and that is something you might want to look up online. The pool and hot-tub were also very nice! Next we traveled to the cloud forest and a resort called 'Bosque de Paz'. This was a nice place with some great trails. Our only issue here was that we had a few too many multi-legged guests in our room for our comfort. Very good food though, and some beautiful hummingbirds and streams to photograph. Our last stop was back to the wonderful rooms at the Hotel Bougainvillea for a final day of shooting.Throughout the trip we stopped at various places for photo shoots/clinics. A couple of times Greg set up an amazing lighting scene to shoot hummingbirds, and we have included many shots from those sessions. We can't say enough about Greg -- he has a vast amount of local knowledge, and he did a fantastic job of gently advising/instructing. He also was great about putting the attendees first (not a common thing during photo tours). We should also mention the outstanding support of the tour naturalist Jose Lopez Vargas -- who doubled as our driver for the tour. He was very helpful during shoots, and very knowledgeable about wildlife. We would highly recommend both Greg Basco and Jose Lopez Vargas for anyone into photography that is planning a trip to Costa Rica. This trip was really fantastic. The sights, the people, the food -- all really great! This is definitely on our list of places to re-visit. Okay, we've said enough! We hope you enjoy our images.